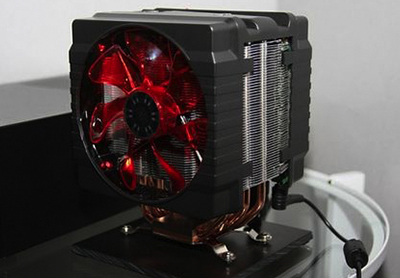 How do you improve your PC heat sink cooling efficiency? – A question asked by many overclockers and PC enthusiasts but rarely do they get a complete answer in one place. In this article, I will discuss some ways you can increase the cooling efficiency of your PC heat sink, keeping your processor, GPU, and other PC parts chilly and your overclocks up. It’s accepted by PC enthusiasts and Overclockers that a solid connection between the PC components and heat sink (or water-block) will aid your heat sink cooling efficiency. In many cases will decrease your components temperature by a few degrees, which is why it’s important to have a quality thermal paste in your toolbox. While a few degrees may not seem like a lot when you combine this with the other cooling methods, it all adds up. There are many different cooling compounds on the market, and it can get a little overwhelming trying to find the best one, but here is the only thermal compound in my toolkit. Artic Silver 5 CPU Thermal Cooling Compound or ‘AS5’ is regarded as one of the best CPU cooling pastes composed of 99% silver. Many other manufacturers have tried to imitate or replicate this and not had much success, once this thermal compound has been applied to your processor and has ‘cured’ its one of the best thermal compounds to have on your components that is unless you go sub-zero. This is personally the only cooling compound in my arsenal, and I use it on all of my components. Just replacing the thermal compound on your stock cooler can decrease your temperatures by up to 5 degrees, for a small investment of $2 + PP its a small price for such animal cooling power. Another popular thermal compound on the market is Noctua NT-H1 Thermal Compound. While the initial outlay is a little more at $5.47 you do get more thermal compound in the tube compared to Artic Silver 5 and performs nearly as good. There is a few upsides to this thermal compound. It does not conduct electricity unlike AS5 which does (being silver based); it does not require curing, and it has low viscosity, meaning its does not require spreading like some other well-known brands. I have used Artic Silver 5 for over 15 years and believe in brand loyalty. Not only that I am a little stuck in my ways, I had tried this compound before and noticed no difference between this and AS5 except for its viscosity. Either compound are both viable purchases with great cooling efficiency. Airflow is often a point some people overlook. They often think because they have a top of the line heat sink churning away in their case that they are reaching their full cooling potential, but that is not true at all. When cooling on air, The minimum temperature you can achieve is determined by your ambient case temperature as well as other factors, but let’s focus on this. 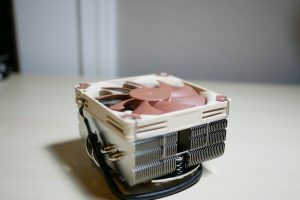 If your airflow is not setup correctly you are hindering your cooling efforts, the cooler you can make your ambient PC case temperature, the cooler you can make your PC other components. Your heat sink cannot make something cooler than the air surrounding it. 1) Heat rises, this configuration forces the fresh air coming in from the back of the PC case, straight out the top of the case via the power supply, this essentially starves the case of fresh air allowing heat to circulate and build up. I would expect to see excessively high temperatures with this fan setup. 2) We should be trying to improve cooling efficiency, this fan setup is recycling air and forcing it to the bottom of the case to only rise back up again. This setup is improving the principle of thermodynamics ( Heat Rises ). We are increasing the rate in which heat is dispelled from the case pumping cold in from the bottom and ‘sucking’ it out of the top of the case. We are creating a ‘tunnel’ of air that pulls heat away from your components. 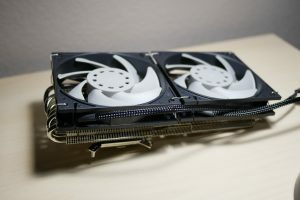 The hot air escapes through the back of the case and out the top and back of the computer away from components instead of recycling the hot air like in example 1. If you have your PC fans set up differently try switching them up and stress testing your computer, you will be surprised how much more efficiently your heatsink performs. Improving your PC cable management is important for a couple of reasons. 2) Our case looks pimping. Your ambient case temperature is largely responsible for determining the minimum temperature you can achieve. By tidying up your cables and organizing them to improve your case airflow, you can reduce your ambient case temperatures even further giving way to higher overclocks on air cooling. Another way to increase your cooling capacity is ‘lapping’ your heat sink and CPU heat conductive surfaces, by doing this you create a smoother contact between the CPU and heatsink. Some people have been known to remove even the TIM altogether to ensure maximum cooling power, but I don’t recommend that unless you are confident with a craft knife around high-end delicate PC components. There you have it, the most common way to increase your CPU cooling efficiency. If you wanted to go completely crazy you could always consider water cooling your gaming pc, you would still have to keep good PC case airflow, but your radiator can be placed outside your computers case..if you are feeling really daring you can even put the water cooling radiator in the freezer for fun! brrr chilly.